When you open your cabinets do Tupperware lids fly out at you? 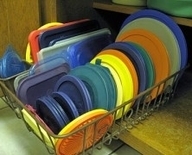 Try this simple trick to keep those lids organized using a dish drainer, find out more over on In this Crazy Life. Awesome idea! I know I’m always trying to figure out how to keep my tupperware all together neatly as well as my pots/pans lids …… so many times I feel like I’m going to open the cabinet and be “attacked” by a lid sliding out onto my foot, I mean the floor. Thanks for the idea – I will be trying this one.